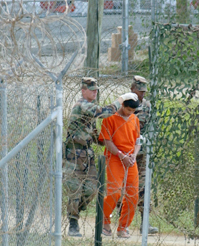 Does the U.S. treat detainees from Afghanistan fairly? The war on terrorism unleashed by the Sept. 11, 2001, attacks has raised questions about how civilized nations should confront enemies that flout established international humanitarian law. Amnesty International and other groups contend the United States is violating the Geneva Convention — which mandates humane treatment of civilians and prisoners of war (POWs) — by holding captives from the war in Afghanistan incommunicado. But the administration says its Al Qaeda and Taliban prisoners do not warrant POW status because they did not represent legitimate states. Meanwhile, religious leaders say attacking Iraq would not constitute a “just war” because Saddam Hussein does not pose an imminent threat. But others say Hussein must be confronted because he has used weapons of mass destruction before and could do so again.